Last week we recalled President Herbert Hoover’s brief whistle stop in Pekin on Nov. 4, 1932. 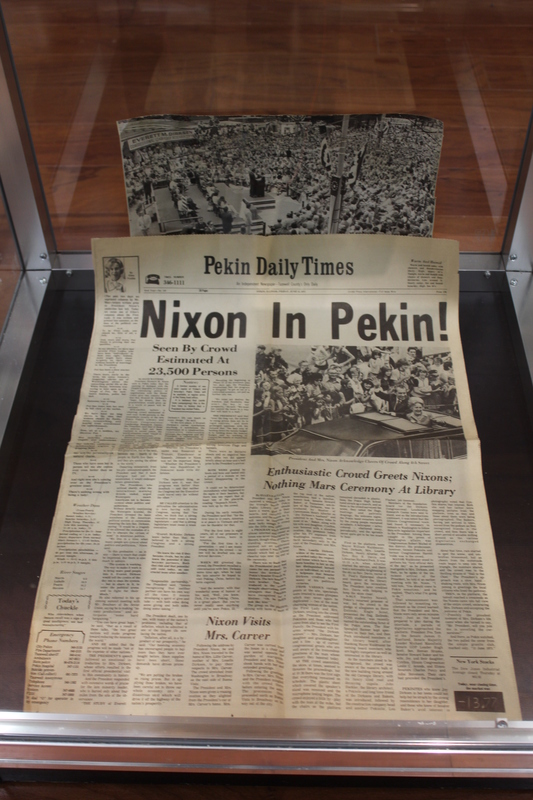 The library also recently exhibited mementos and articles having to do with the links that various U.S. presidents have had with Pekin. To continue with this “presidential” theme, this week we will take a look at one of the volumes in the Pekin Public Library’s Local History Room collection. 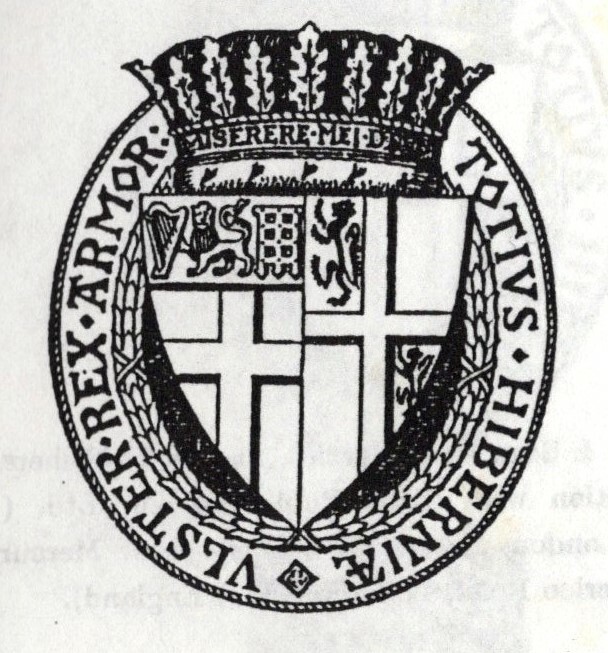 It’s a 792-page book entitled, “American Presidential Families,” compiled and edited by Hugh Brogan and Charles Mosley, and published in 1993 by Burke’s Peerage & Baronetage, a 191-year-old company that specializes in the genealogy of the nobility and royalty of Britain and Ireland. Burke’s interests also extend to the genealogy of notable or powerful families of some of Britain’s former colonies, which is why they prepared a volume on the ancestry and descendants of American presidents. “American Presidential Families” includes biographies, family histories, and genealogical charts for every U.S. president from George Washington to Bill Clinton. For some presidents, the genealogies are extensive and detailed (Washington’s family history alone fills pages 45-99 of this book), while others came from families of whose ancestry not very much is known (as is the case with Andrew Jackson, Andrew Johnson, Ronald Reagan, and Clinton). Of President Jackson’s ancestry, for example, we know nothing more than the names of his parents, his paternal grandfather, his paternal great-grandfather, and only the surnames of his maternal grandparents. As for Andrew Johnson, almost nothing certain is known of his father’s ancestry, while on his mother’s side only his maternal grandfather and great-grandparents are known. Given the United States of America’s origin from 13 of Britain’s North American colonies, it’s natural that the genealogies of all U.S. presidents trace back to England, Scotland, Wales, and Ireland. In most cases, it’s the president’s direct paternal line that goes back to Britain or Ireland, while his ancestry may indirectly go back to other European countries. However, we have also had a few presidents whose paternal line goes back to the Netherlands or Germany – and, of course, very recently we had a president whose father was born in Kenya but whose mother had a typical white American ancestry originating in Britain (though President Barack Obama’s genealogy of course is not found in the 1993 “American Presidential Families”). Something else that should not be surprising to learn is that many of our presidents were related to each other. In fact, genealogists have found that a very large number of Americans of white European ancestry share at least one common ancestor who lived from eight to 11 generations ago. The kinship of several of the earliest presidents, however, was much closer than that. Thus, while George Washington’s popular title “Father of His Country” isn’t literal, Washington was in fact related by blood or by marriage rather closely to a number of the first presidents: James Madison, for instance, was the second husband of Martha Washington’s sister, while Zachary Taylor was George Washington’s third cousin once removed. Other presidential family ties were somewhat more indirect or convoluted – Lincoln’s second cousin Mary Sophia Lincoln was the first wife of William Ramsay Brown, whose second wife was Mary Johnson Stover, younger daughter of President Andrew Johnson, Lincoln’s vice president and successor. Like many other Americans, quite a few presidents were descendants of European aristocracy and royalty. This is particularly true of George Washington, whose paternal lineage has been traced through the centuries father-to-son all the way back to Maldred, Lord of Allerdale, younger brother of Duncan I, King of Scotland – the same Duncan who was killed by Macbeth on Aug. 14, 1040. By virtue of their descent from noble families in Britain, many U.S. presidents are known to be distant cousins (sometimes very distant). The lives and accomplishments of most of our presidents have been remarkable and memorable. The intertwining and entangled branches of the family trees of American presidents are not at all unique or remarkable, though. Rather, they are representative of the same kind of intermingling that has created numerous genealogical connections between most American families – the kind of extensive family ties and common ancestry that constitute the tangible substance of a nation, which may be thought of as groups of families grown very large. 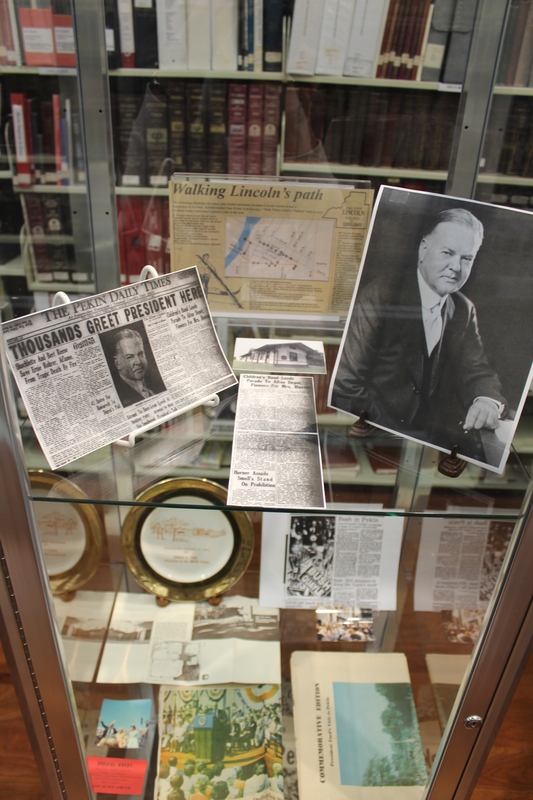 The Local History Room display, which will be exhibited through Lincoln’s Birthday next month, includes mementos of Lincoln, Hoover, Nixon, Ford, and Bush. This week’s “From the Local History Room” column spotlights a recent addition to the Pekin Public Library’s Local History Room collection (previously announced here). 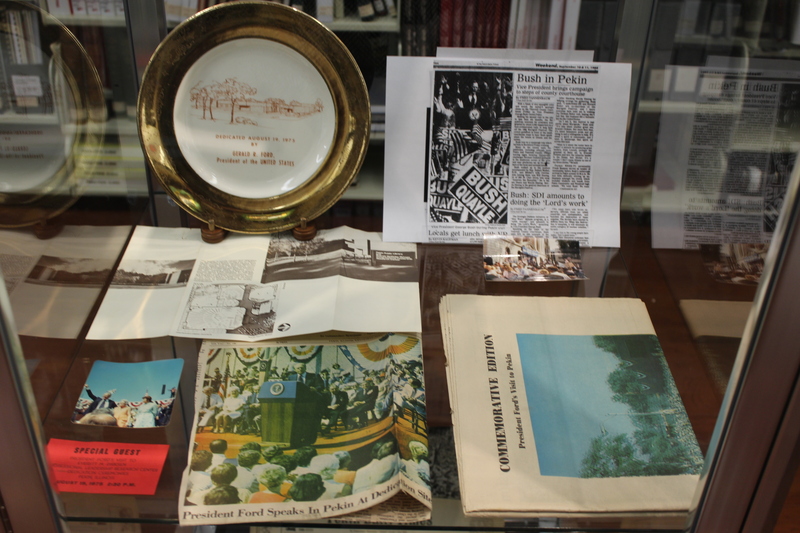 The library last month received a donation of an impressive collection of materials and memorabilia from the 2008 and 2012 presidential campaigns of Barack Obama as well as some historical materials from Obama’s time as a U.S. Senator for Illinois from 2004 to 2008. These materials, which include numerous U.S., European, and Canadian newspapers, magazines, and assorted political campaign and convention memorabilia, were donated by Amy and Mark Werner of Pekin. Amy Werner was the first director of Pekin Main Street, and she and her husband are active in Democratic Party politics. Obama’s chief place in history is as the first African-American to be elected president of the United States. Notably, one of the articles in the Werners’ collection is a Peoria Journal Star opinion column by James Unland, formerly of Pekin, which recalls the link between Obama’s historic election in 2008 and perhaps the most important achievement of U.S. Sen. Everett McKinley Dirksen of Pekin. “As President-elect Obama prepares to enter the White House,” Unland wrote in the Jan. 4, 2009 Journal Star, “it is worth remembering that it was central Illinois’ own Senator Everett Dirksen who orchestrated what has been called the single most important congressional vote of the 20th century, the U.S. Senate’s vote to close off the civil rights debate on June 10, 1964. “That vote, which ended a 12-week filibuster by southern Democratic senators, paved the way for the final passage of the 1964 Civil Rights Act. The move was significant enough that it landed Dirksen on the cover of Time magazine on June 19, 1964. As it happens, the Werners until recently owned and lived in Dirksen’s former home. Obama’s own direct link to Pekin is a visit to the Pekin Public Library during his time in the U.S. Senate. The Werners’ donated materials are available for researchers in two archival boxes in the wide storage cabinet in the back corner of the Local History Room. The newest addition to our Local History Room collection is a donation of materials from the 2008 and 2012 presidential campaigns of Barack Obama. These materials, which include numerous U.S., European, and Canadian newspapers, magazines, and assorted political memorabilia, were donated to the library earlier this month by Amy and Mark Werner of Pekin, who until recently owned and lived in the former home of Senator Everett McKinley Dirksen. 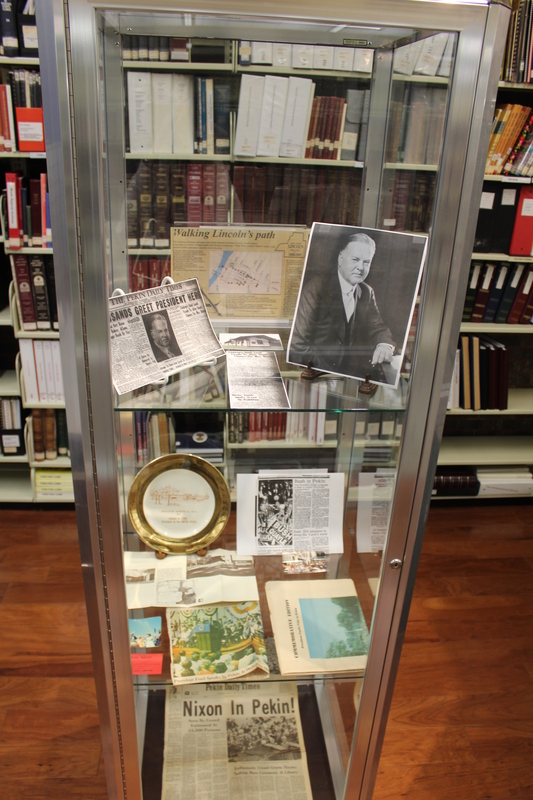 The Werners’ donated materials are available for researchers in two archival boxes in the wide storage cabinet in the back corner of the Local History Room. Shown here is a sample article highlighting some Dirksen history from the Werner collection of Obama materials.